The islands of the Bahamas are surrounded by coral reefs and shallow sandbars that swarm with tropical fish. But bigger things swim there as well, and many are not shy about meeting humans. The promise of a small snack is often enough to entice southern stingrays to come close and brush up against a wader's leg, while sea turtles may approach out of simple curiosity. Even more exciting are the visits paid by the wild dolphins that will join divers and snorkelers for a swim, or sometimes initiate a game of underwater tag. At select sites across the islands, such interactions are all but guaranteed. Stingray encounters typically take place in shallow water over sand bottoms. This allows participants to stand comfortably without having to kick or swim. Turtle and dolphin encounters may take place in shallow depths or in deeper water with participants wearing snorkel or scuba gear while swimming with the animals. 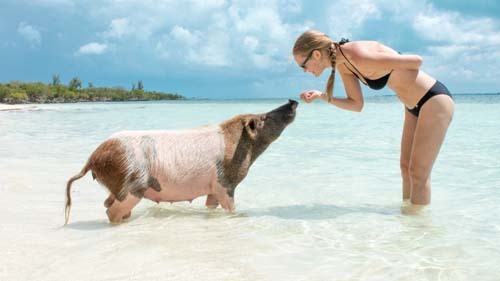 Many marine animals will become accustomed to contact with humans, but they are not tame or trained and should be treated with respect and reserve. Avoid aggressive and harassing behavior, as this often results in the animal moving away. A soft stroke of a passing stingray's wing or a pat of a dolphin’s flank is considered appropriate. After a beach picnic on deserted Manjack Cay, everyone wades in and sticks fishy morsels between toes, then resident stingrays slurp up the treats as their silky-sleek bodies brush and tickle exposed feet. A boat ride from aptly-named Green Turtle Cay puts swimmers in the water with wild sea turtles. On Grand Bahama Island, you can hug a dolphin or don snorkel gear to join the pod on a tour of the reef. You won't need fins or even reef shoes to enjoy a stingray pedicure, but you should bring or rent snorkel gear and a towel because trips often include additional stops for snorkeling and swimming. 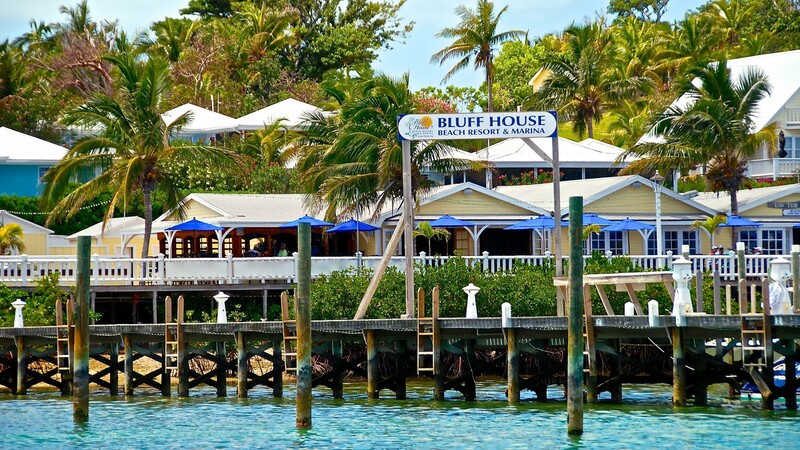 ABACO - Bluff House Beach Resort & Marina is located on Green Turtle Cay, Abaco, in the Bahamas, three miles off the east coast of Great Abaco which is approximately a one-hour flight from Florida. Perched on the highest point of Green Turtle Cay, this 12 acre tropical paradise stretches from White Sound to the Sea of Abaco. Many have described it as the “most special piece of property in Abaco". Located on Green Turtle Cay is a vacation paradise for sailors, divers and fishermen. Snorkeling and SCUBA diving is a popular adventure with the world’s third largest barrier reef just a short boat ride away. You can beachcomb for shells and tossed up treasures from the sea on our power-soft, white-sand beaches or take a leisurely boat ride and explore the many nearby deserted cays. .